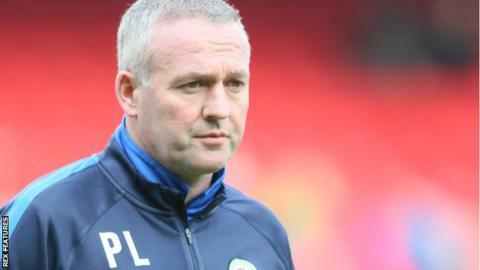 Blackburn Rovers boss Paul Lambert has told his players they must be aware their winless run could see them drawn into a relegation fight. Rovers have failed to win in nine Championship games and have collected just four points since 11 December. Saturday's 2-0 home loss against Hull saw the Ewood Park side slip to within five points of the relegation places. "I've said to the lads 'you've got to start looking over your shoulder'," Lambert, 46, told BBC Radio Lancashire. "You can't just think 'we'll be ok'. Football owes you nothing, you have to go an get it and we have to go and get it really quickly starting on Tuesday - we have to start to win." Since taking the Blackburn job in November, the former Aston Villa and Norwich boss has made seven additions but he is still hoping to bring in more players now that the loan window is open. Following Saturday's defeat, Rovers brought in Swansea City midfielder Matt Grimes on a three-month deal. "The loan market is a difficult market to operate because not many players or teams want to let their bigger ones go," he added. "I think the squad needs to bring in somebody, but we need to try and keep playing football and get that balance between somebody I think can handle this league and play with the ball."